All of us at Lady Pamela II sportfishing wish a Happy New Year 2016 to all of our angling friends and fans! For those of you who are not familiar with us, Lady Pamela II sportfishing is one of the oldest and most reputable charter fleets in Broward County. As owner and captain, I am a third generation fisherman from Fort Lauderdale, who grew up fishing South Florida’s famous waters. I have extensive tournament and sportfishing fishing experience and am in demand as either a captain or mate on tournament boats. My captains, mates, and I love to fish and are ready to help you land that trophy catch. 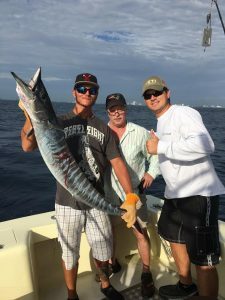 In 2015, we spent thousands of hours fishing, kitefishing with live bait for sailfish, bottomfishing for snappers and groupers, trolling for kingfish, wahoo, and tuna, or fishing deep for trophy sharks. You name the fish, and I know we caught it last year! Lady Pamela sportfishing continues to work closely with both federal and state fishery conservation efforts, tagging and releasing billfish (sailfish and marlin) and sharks. If you happen to be in the Fort Lauderdale/Hollywood area and feel like fishing we’ll do our best to give the experience of a lifetime. Give us a call.